Balances is a charming little fanmade game based on Infocom's Enchanter games. 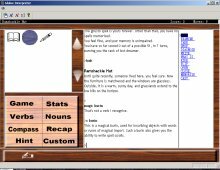 From Carl Muckenhoupt's succinct review: "A small unofficial sequel to Infocom's Enchanter trilogy, based partly on their sample transcripts and partly on the need for a better look at the last four cubes in Spellbreaker. The main reason this game was written was to show off the more advanced features of Inform, such as dynamic vocabulary and indistinguishable objects. It's still a pretty good little game in its own right, with loads of clever spellcasting. One required action is completely motivationless and somewhat suicidal, but you might hit on it if you try things just to see what happens." First released as a z-code (Inform) game, Balances has now been ported to Glulx by L. Ross Raszewski, with nice enhancements like graphics for inventory items and a graphical GUI. If you enjoyed Enchanter trilogy, you will probably like this nice little game that was intended as a demo of Inform, but is a much more complete release than most demos. A nice fanmade epilogue to the series, although it will take you only a short session to solve. Thumbs up!